Air Service Cavalry Assault Troops Signal Troops Pickelhauben Steel Helmets VehiclesThis second volume in the Uniforms and Equipment of the Imperial German Army 1900-1918: A Study in Period Photographs series, contains over 500 never before published photographic images of the Imperial German military forces. 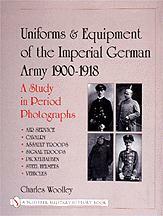 Contained in this volume are photographs of: machine gun troops and their equipment; assault troops with grenades and their specialized equipment; the M1895 blue uniform; minenwerfers and crews; steel combat helmets; decorative steins, pipes and patriotic items; telegraph and signal troops; field artillery troops and their personal equipment; kraftfahrer and vehicles; Model 1915 ersatz pickelhauben; cavalry, including Dragoons, Bavarian Chavauleger, Jger zu Pferde, Ulans, K rassiere, and Husaren; eisenbahn troops; flak anti-Aircraft artillery; Imperial Air Service; commissary; heavy artillery guns; horses and pets; and, finally, pickelhauben in detail. The color section features the M1915 uniform illustrations by Paul Casberg, which originally appeared in the 1916 volume by Moritz Ruhl Verlag, Die Deutsche Armee in ihren neuen Feld-und Friedens-Uniformen. Each photograph and caption has been carefully researched affording the reader much information not to be found elsewhere, plus the inclusion of a glossary and an annotated bibliography which make this volume essential for the serious military historian, collector and World War I re-enactor.